1. Quickly getting documents from dropbox, box.net, and web, moreover, it can automatically convert any version documents (except doc, docx) into PDF version. 2. After annotating a document, it can quickly share the document to dropbox and other storage method. To highlight this point, this powerful app could share one or more specific slides of the whole document to the dropbox with the voice record (including from lecturer and yourself). After using it for a week, I found this app can replace any other note-taking app. In terms of functionalities, it can let you do annotations on the slide without having to open a new window so that this is convenient for reading the slides. Moreover, it both supports type and handwriting (including pencil and mark pen) and more interestingly, you can change the font and colour of your notes. Simply, this would be more similar to our traditional way of taking notes. In addtion, it has a more powerful function that you can record your vocie notes rather than typing words. This seems to be useful for modify at home for reviewing. In terms of taking a screenshot on the ipad, it is a simple power button press and home button at the same time. After that, I can find this screenshot in my photo gallery. So, this screenshot could be easliy upload by dropbox and download on my computer anywhere. In all, the iPad plays an important role in my daily life as well as my iphone and laptop. I would say this intergration of studying, palying and connecting is incredible and have already changed my lifestyle. Next time I am considering purchase a ipad bluetooth keyboard because of the less efficient simulating keyboard, but i got to say iPad is productive. Although i used Ipad for long time, i never try to use it to take note because that it would disperse my concentration in class. This experience definetely impressed me so much. At first, when i downloaded the electronic lecture note, i try to use keynote (Apple’s PPT app) taking notes and use record app to record Adam’s speaking. I met some problems: 1. there is no particular tools for taking note within keynote, except the “presentor’s note”; this note, however, is already done by Adam. So that i cannot do it seperately, unless continue this note. 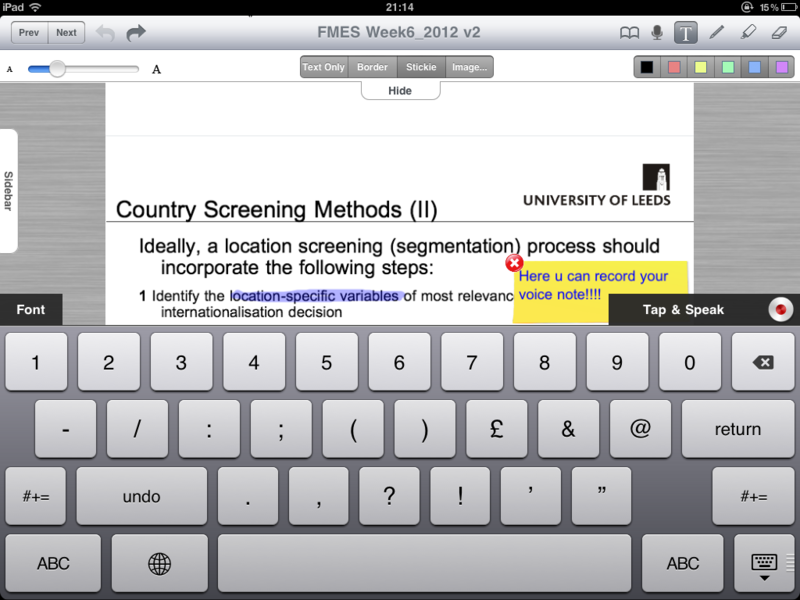 2. when i am typing, i cannot see the slides in the same time. 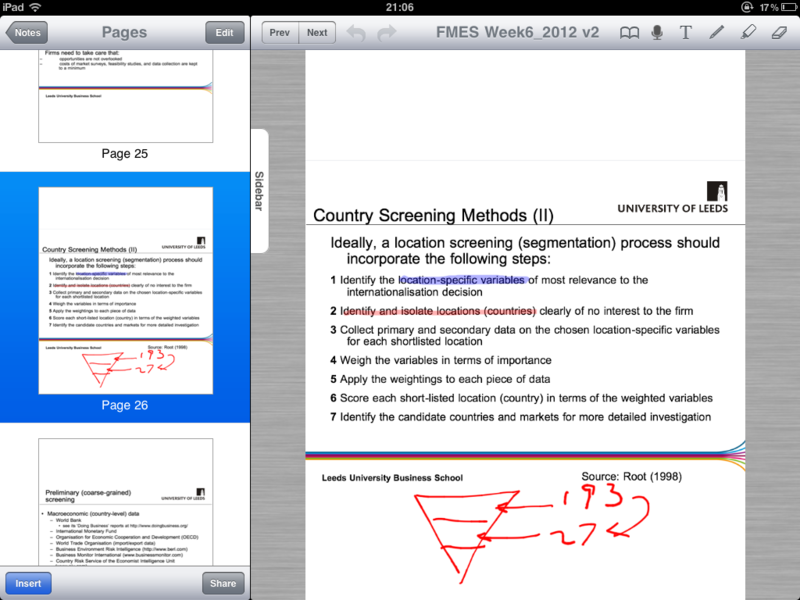 3. the record app works separately, it seems not very helpfu for taking note. Suffering from these problems, it seems to trouble me even i use other tools instead. like that i try to convert PPT into PDF and use goodreader instead to annotate, however, it is still not very qucik and convenient for fast annotating. Finally, i give up these apps and seek alternatives. Fortunately, i got a solution. 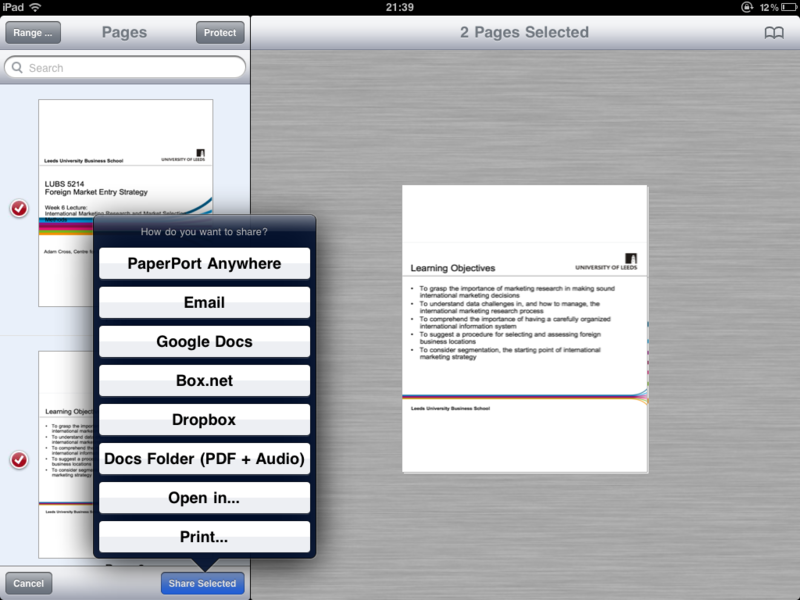 Here, i recommend all of us to use the new app–PaperPort Notes, which previously called Noterize. This special app combines note take, document annotate and audio record together. when i first saw a trail video on YouTube, i felt it is grearful. freestlye writing on lecture slide (able to annotate PDF, PPT version, DOC is unavailable), different styles of pens (such as pecil and highligher in different colors) and record anytime any part when you think it is essential. In a short, this app have solved most problem that we talked in the meeting , i recommend all of us to have a try on this incredible app, BTW, this is free on Appstore. As i have used IPad 2 for several month, I would say that there are still many techniques i never heard before, but these techniques are very useful and efficient for users to know the charm of IOS. a, when you put all five of your fingertips on the screen and pinch them together, you would find the home screen without tapping the home button. b, when you place four of your fingertips on the display and slid them up to the screen, the multitask bar would be shown as well as the way you double tap the home button. c, when you put four of your fingertips on the screen and slid them to left or right side, this would quickly help you switching between apps which you are using now. these three tips would help you get rid of the home button and extend its life expectancy.